GANGNEUNG, SOUTH KOREA I just want to drop a few names on the Chicago Blackhawks “fans” who had their butts not-so-surgically removed from their United Center seats Saturday for allegedly hurling racist taunts at Washington Capitals forward Devante Smith-Pelly. Dirk Graham, Johnny Oduya, Dustin Byfuglien, Ray Emery, Jamal Mayers, and Trevor Daley. These are black players or players of African descent who skated for the team that you root for – or rooted for before Blackhawks management ejected you from fairly high-priced seats for supposedly directing racial remarks toward Smith-Pelly. Black players helped make the Blackhawks winners and hoist Stanley Cups. Oduya was a mainstay on defense on the ‘Hawks 2012-13 and 2014-15 championship teams. Emery was the solid backup goaltender for the 2012-13 Cup winner. Mayers, a forward, added defensive toughness to that team for 19 regular season games that season. And Byfuglien was a disruptive power forward that the Philadelphia Flyers struggled to control in the 2009-10 Stanley Cup Final. Former Chicago Blackhawks goalie Ray Emery. Graham was a gritty heat-and-soul captain of a Blackhawks teams that were competitive. He even scored a hat trick in Game 4 in the 1992 Stanley Cup Final won by the Pittsburgh Penguins. These are all men of color who played for your team. For. Your. Team. Imagine if Oduya, Byfuglien, and Emery adhered to the taunts aimed at Smith-Pelly and they played for, say, the NBA’s Atlanta Hawks instead of the NHL’s Blackhawks? The idea that you could be shocked and appalled in this day and age at the sight of a black guy being on the ice or in the penalty box at a hockey game means you either don’t know your own team or that Smith-Pelly’s skin simply got under yours. Either way, it wasn’t a good look. I wonder what recently-acquired Blackhawks forward Anthony Duclair must be thinking after watching those home “fans” giving an opposing minority player the business by using race as a weapon. Former Chicago Blackhawks defenseman Johnny Oduya. Kudos to the management of the Chicago Blackhawks, Washington Capitals and National Hockey League for taking swift action on this ugly incident. “It just shows ignorance,” he added. K’Andre Miller remembers getting occasional odd looks or sometimes racially-coded responses after telling people what sport he plays. K’Andre Miller, defense, USA Hockey’s National Team Development Program (Photo/Rena Laverty/USA Hockey). As a defenseman on USA Hockey’s National Team Development Program Under-18 squad, Miller is proving them wrong. The 6-foot-3, 191-pound 17-year-old from Minnetonka, Minnesota, is blossoming into a blue-chip blue-liner for the NTDP after making the switch from forward only two season ago. Miller, who’ll turn 18 on Jan. 21, will be eligible for the 2018 National Hockey League Draft in June in Dallas. NHL Central Scouting gave Miller a “B” rating last month, meaning he’s projected to be second or third-round pick. He played in the 2017 CCM/USA Hockey All-American Prospects Game in Buffalo, New York, in September. He’s tallied 2 assists in the U.S. National Under-18 team’s first 13 games of the 2017-18 season and notched 3 goals and 14 assists in 54 games for the Under-17 squad in 2016-17. NHL Central Scouting projects defenseman K’Andre Miller to be a second or third-round pick in the 2018 NHL Draft in June (Photo/Rena Laverty/USA Hockey). Headquartered in Plymouth, Michigan, the national team development program competes internationally, and also plays U.S. colleges and teams in the United States Hockey League, the nation’s only Tier 1 junior league. While Miller has his sights set on playing in the NHL, he’ll attend the University of Wisconsin first. He’s committed to play for the Badgers and Head Coach Tony Granto – who’s also the bench boss for the 2018 U.S. Winter Olympics men’s hockey team in South Korea in February – starting in the 2018-19 season. If Miller achieves his NHL goal, give an assist to to Minnesota Wild team captain Mikko Koivu. “For my ninth birthday, I went down to Dallas to watch the Stars play the Wild,” Miller told me. “We went down to the locker room after the game and Mikko came up to me, shook my hand, said happy birthday, and asked when the next time I would be at a home game in Minnesota because he was going to try to get me a stick. K’Andre Miller looks forward to playing in the NHL someday. But first he’ll play for the University of Wisconsin, starting next season (Photo/Rena Laverty/USA Hockey). That experience helped seal the deal for Miller wanting to become a professional hockey player. But Miller’s uncle, Ken, should also get an assist for exposing his nephew to the game at an early age. “He would take me out on the rink when I was little,” Miller recalled. “I started skating when I was two and he kind of helped me, put a stick in my hand, kind of taught me the game. K’Andre Miller, right, is all smiles playing for USA Hockey’s National Team Development Program (Photo/Rena Laverty/USA Hockey). Minnesota has produced several talented black hockey players, including Winnipeg Jets defenseman Dustin Byfuglien, forwards Kyle Okposo of the Buffalo Sabres and J.T. Brown of the Tampa Bay Lightning, and Keegan Iverson, a 2014 NHL draftee who plays for the Ontario Reign, the Los Angeles Kings’ American Hockey League farm team. But that hasn’t stopped some folks from wondering what the tall black kid from Minnetonka is doing on the ice with a stick in his hand. Miller takes pride in showing doubters that he’s built for the NHL. The World Cup of Hockey is only a few days old and already players of color are having a huge impact in the best-on-best international tournament – from a brother from France scoring to Big Buff sitting. Pierre-Edouard Bellemare, a Philadelphia Flyers forward and Team Europe’s only French member, put a dagger in Team USA in the World Cup opener Saturday, scoring on a neat second-period tip-in in Europe’s 3-0 shocker over the United States. On a Europe squad stacked with firepower the likes of Anze Kopitar of the Los Angeles Kings and the Chicago Blackhawks’ Marian Hossa, Bellemare made the most of his 15 minutes-plus of ice time, registering a goal, one shot, and one hit. He won 36 percent of his face-offs. While Team Europe basked in its upset victory, Team USA Head Coach John Tortorella faced questions about his decision not to dress Winnipeg Jets defenseman Dustin Byfgulien for Saturday’s game. The 6-foot-5, 265-pound Byfuglien is one of the National Hockey League’s best offensive blue-liners, blessed with one of the league’s hardest and most-accurate shots. He was eighth in scoring among NHL defensemen last season with 19 goals and 34 assists. He’s the highest-scoring defenseman on a Team USA roster that includes John Carlson and Matt Niskanen of the Washington Capitals, Jack Johnson of the Columbus Blue Jackets, Erik Johnson of the Colorado Avalanche, Ryan Suter of the Minnesota Wild, and the New York Rangers’ Ryan McDonagh. I can't think of a single coach in the NHL, save for John Tortorella apparently, who would choose Jack Johnson over Dustin Byfuglien. Don’t know about you, but I think Tortorella might pencil Byfuglien into the lineup when Team USA faces Canada Tuesday night. Byfuglien and Bellemare are among five players of color participating in the eight-team World Cup of Hockey tourney. Montreal Canadiens goaltender Carey Price, whose mother is a former chief of the Ulkatcho First Nation, Toronto Maple Leafs rookie forward Auston Matthews, and Blue Jackets defenseman Seth Jones are the other three. Evander Kane goes from the True North to Western New York in trade. After years of trade rumors, the Winnipeg Jets and forward Evander Kane have finally parted ways. The Jets shipped Kane, who had season-ending left shoulder surgery, defenseman Zach Bogosian, and college goaltender Jason Kasdorf to the Buffalo Sabres Wednesday in a seven-player trade. The Jets received gigantic defenseman Tyler Myers and forwards Drew Stafford and Joel Armia. Winnipeg also received the rights to Barrie Colts forward Brendan Lemieux, who was Buffalo’s 2014 second-round draft pick. Both teams proclaimed the trade a win-win situation. Buffalo got a big, talented, speedy, tough forward whose shoulder injury won’t allow him to play until next season. Kane can’t help the Sabres this season, meaning the team is still on course to have one of the worst records in the National Hockey League, meaning it will have a shot at the first or second pick in 2015 NHL Draft. That means Erie Otters and Team Canada wunderkind forward Connor McDavid or Boston University and Team USA star forward Jack Eichel could be snacking on Buffalo chicken wings or beef on weck this fall. For Buffalo, mired in last place in the NHL Eastern Conference, it’s all about 2015-16 and beyond. For Winnipeg it’s about here and now. The Jets are sitting in fifth place in the Western Conference, sandwiched between the fourth-place Chicago Blackhawks and the sixth-place Vancouver Canucks. The Jets and their fans desperately want the team to make the playoffs for the first time since it relocated from Atlanta, where it was called the Thrashers. By unloading Kane, Winnipeg’s management may feel that they’ve made an addition through subtraction. He had developed a reputation as a problem-child – an immature, bad teammate. In addition, his brashness rubbed some Winnipeg residents the wrong way. His hip-hop hairstyles and photos of him clutching wads of cash in his hands didn’t endear him to some folks in Manitoba’s capital. Kane summed up the negative perception of him in an interview with The Hockey News in 2013. “I think a good portion of it is because I’m black and I’m not afraid to say that,” Kane told the publication. In Myers, the Jets get the 2009-10 NHL Rookie of the Year whose play had been up and down ever since. Winnipeg’s counting on a change of scenery and a shift to a winning franchise to improve his play. One thing’s for sure, the 6-foot, 7-inch Myers, paired with 6-foot, 5-inch, 260-pound defenseman Dustin Byfuglien, will give the Jets size that any NBA team would love. Winnipeg also gets an intriguing and motivated prospect in Lemieux, the son of former Stanley Cup-winning super-pest Claude Lemieux. Evander Kane has a wounded shoulder. Brendan Lemieux has a chip on his. He was the first player selected in the second-round of last year’s draft, but thought he was first-round material. Lemieux vowed to make teams that bypassed him pay. Expect him to enter the Jets training camp in September gunning for a roster spot to deliver on his word. New York Islanders forward Kyle Okposo spends a lot of time these days waiting- and it never felt so good for the Minnesota native. Okposo and his wife are expecting the birth of their first child in January. He’s waiting for the Islanders 2015 move from Long Island to suddenly hip downtown Brooklyn and the Barclays Center And he’s waiting to learn whether he’ll make the cut and play for the United States men’s hockey team at the 2014 Winter Olympics in Sochi, Russia, in February. Kyle Okposo awaits birth of first child and berth on U.S. Olympic hockey team. Okposo was all smiles Monday as he joined 47 other professional hockey players who were invited to attend USA Hockey’s two-day pre-Olympics orientation camp at the Washington Capitals’ practice facility in Arlington, Va. While he’s waiting for good things, Okposo admits that – to borrow a line from a Tom Petty and the Heartbreakers song – the waiting is the hardest part when it comes to whether or not he’ll be selected for Sochi. The final decision on the team won’t be made until the weeks before the Olympics. The U.S. national team, piloted by Pittsburgh Penguins Head Coach Dan Bylsma, will pick talent based on how the invitees to this week camp perform for their NHL or minor league teams in the opening months of the season. Okposo hopes he’ll have a better start to the upcoming season that he did during the labor dispute-shortened, 48-game, 2012-13 season. Last season, the right wing only registered only 4 goals and 20 assists. But he turned things around in the second half on the season. He scored three goals and one assists in six games in the Stanley Cup playoffs opening round against the Pittsburgh Penguins. The Islanders lost the series. His numbers pale compared to those of Chicago Blackhawks right wing Patrick Kane, Toronto Maple Leafs forwards James van Reimsdyk and Phil Kessel, and other players invited to the pre-Olympics camp. But he has intangibles that the U.S. national team covets. Okposo has experience playing on larger ice surfaces like the one in Sochi. Most rinks international rinks are 200-by-100 feet, which increases the importance of skating ability. NHL rinks are 200-by-85 feet. Okposo spent his college career playing on the University of Minnesota’s international-size ice surface. Both the U.S. and Canada are so concerned about the larger ice surface, which they believe contributed to poor Olympic performances off North American soil, that Canada Head Coach Mike Babcock of the Detroit Red Wings held ball hockey walkthroughs with his prospective players in Calgary Monday in an arena with a melted international-sized rink surface. Defenseman Seth Jones, who the Nashville Predators selected with the fourth pick in June’s NHL draft, has experience on the big rink from playing on the U.S. junior national team that won the gold medal at the 2013 World Championship last December in Ufa, Russia. Though he’s yet to play a minute in the NHL, Jones said he’s setting his sights on Sochi. Seth Jones hopes to make the Nashville Predators – then the Olympic team. Brian Burke, the U.S. national team’s director of player personnel and former general manager of the Maple Leafs, said it’s not beyond the realm of possibility for Jones to wear the U.S. red, white and blue come February. “It might be a steep hill for Seth, but he’s always exceeded expectations to this point and I can see him doing it again very easily,” Burke said. Jones, a Plano, Texas, native said he has to factor in earning an Olympics slot while adjusting to the NHL and its grueling 82-game season. He estimated that he logged 94 or 95 games during the 2012-13 season playing major juniors for the Canadian Hockey League’s Portland Winterhawks, playing in Russia with the U.S. junior national team, and playing for Portland in the Memorial Cup final. He said he “didn’t do anything for two weeks or three weeks, maybe,” after the Winterhawks lost to the Quebec Major Junior Hockey League’s Halifax Mooseheads in the final. Winnipeg’s Dustin Byfuglien wants trifecta: Stanley Cup, All-Star berth, Olympic Gold Medal. 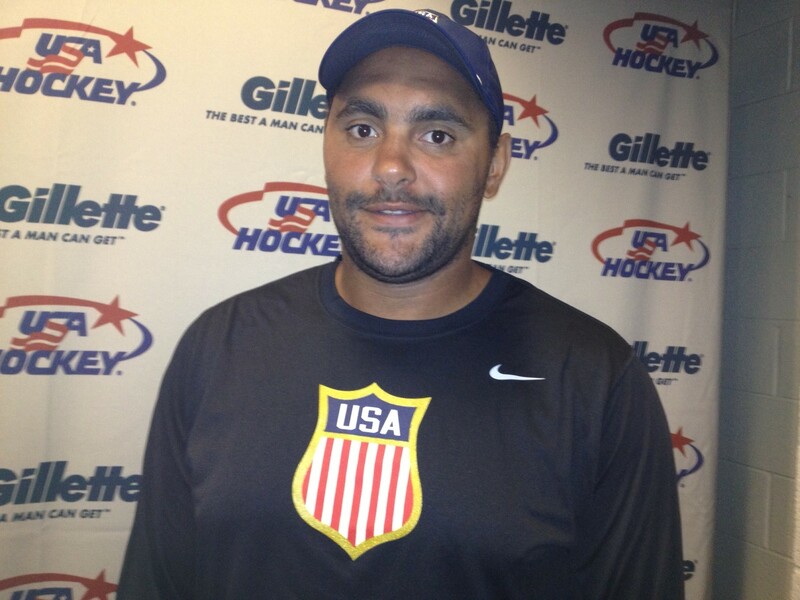 One of Jones’ competitors for a defense spot on Team USA is Dustin Byfuglien of the Winnipeg Jets. For him, making the U.S. team and winning a Gold Medal would be a trifecta. He’s already been named an NHL All-Star and won a Stanley Cup in the 2009-10 season with the Blackhawks. Byfuglien – a massive man with a massive slap shot, nimble skating ability, and the skill to play either defense or left wing – beamed when asked about the possibility of playing for the U.S. hockey team. “It would mean a lot to me and my family just to get the opportunity to go over there and be part of the Olympics,” Byfuglien, a Minnesota native. “This is a fun thing to be part of. Any time you can put on a U.S. jersey and represent your country it means a lot. Burke called Byfuglien a potential game-changing force on the ice.